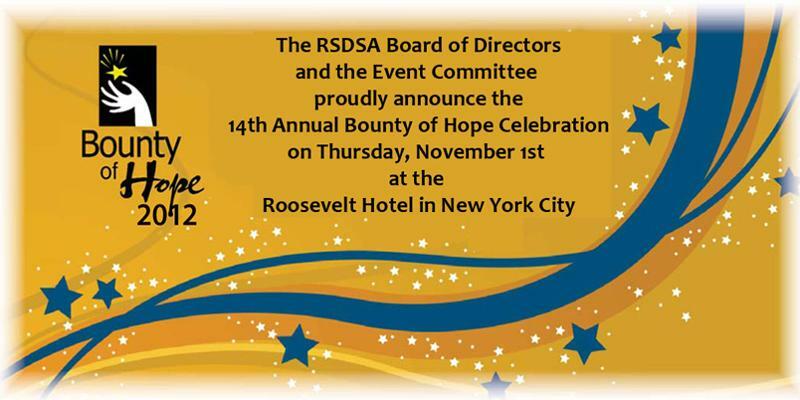 For and about the RSDS/CRPS community. 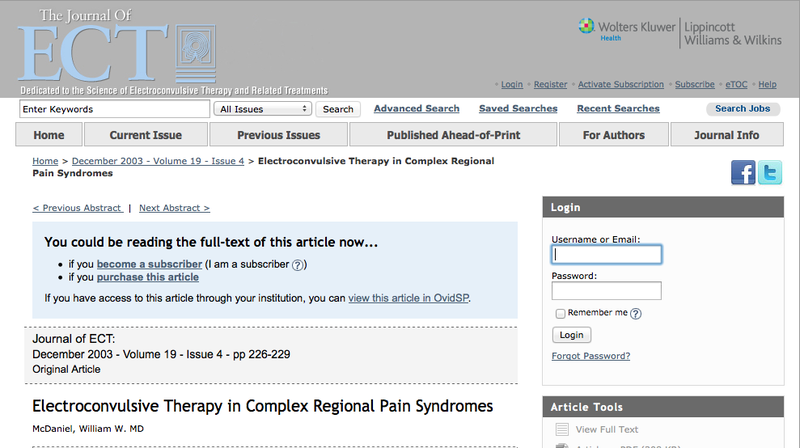 Three cases are presented in which electroconvulsive therapy (ECT) for depression led to the relief of comorbid complex regional pain syndrome as well as depression. In one of the cases, concomitant fibromyalgia was not relieved during 2 separate series of ECT. The literature regarding the role of ECT in the management of chronic pain is reviewed and discussed in light of recent findings about ECT and changes in neurotransmission associated with seizures. Depression responds to medications and/or psychotherapy in most cases. Electroconvulsive therapy (ECT), the oldest modern antidepressant treatment, provides relief in the great majority of the nonresponders. 3,4 ECT has been reported to relieve depression associated with regional pain syndromes and at the same time reverse the signs and symptoms of regional pain syndrome. 5-7 I report here three more cases in which ECT for depression resulted in resolution of a comorbid CRPS. Click here for the original article online. We happened across this video today on YouTube, and while, yes, it’s a few months old, we wanted to share it with you, our readers, and offer up our support to Caroline and everything she’s going through. Stay strong! Some patients have written to us asking for more information regarding the Meningitis Outbreak currently occurring in the USA. It is understandable as many CRPS patients also have back pain and the material in question is sometimes used in steroid injections that chronic pain patients receive. I myself happen to be one of them. I typically get one or more such injections each year. This year I happen to have needed three; two in the last couple of months alone, three in the last four months. 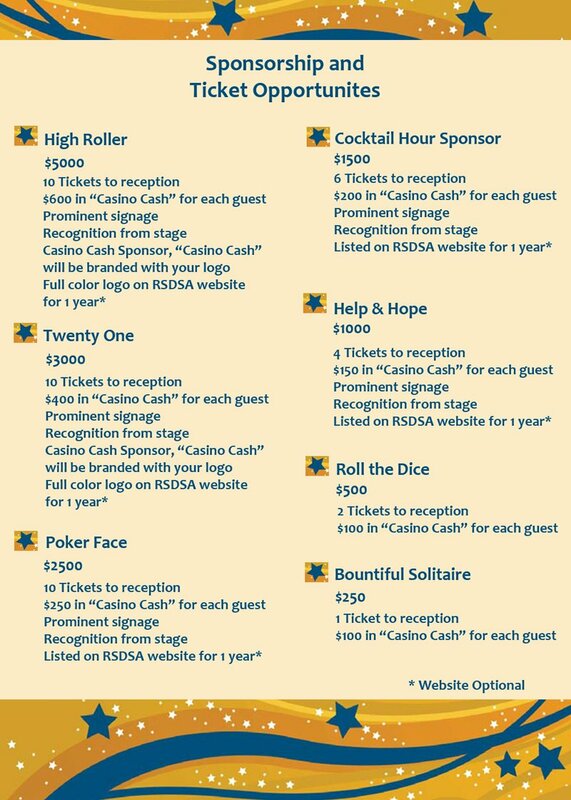 So I did some research and I have posted the latest articles/information on American RSDHope’s website. I will keep the information updated as the story progresses. Let us hope and pray that it resolves quickly and with no more victims. In this section you will find a collection of articles on the Outbreak, explanation of what is involved, what Meningitis is, a list of Clinics/Facilities where the medication was shipped/recalled from, and more. Feel free to pass this link along or post to your on-line groups. KR, 17 year old seen 11/4/11, with Complex Regional Pain Syndrome [CRPS] involving left lower limb from foot to hip, onset 3/09. She has nonspecific immune system abnormalities and many food sensitivities that caused leaky gut syndrome and 30 lb weight loss with certain foods causing the stomach to be rock hard and vomit. Elimination diet allowed her to regain 30 lbs. CRPS diagnosed February 2011, two years after first symptoms. The leg was cold, purple, mottled with allodynia. Pain had been 9 on scale of 10 for weeks prior to my visit when she was started on prednisone 60 mg x 1 week, 40 mg 1 week, and a few days on 20 mg, dropping her average pain to 4/10. Pain at my visit 11/4/11, ranged from 4 to 9, average 5, that was 40% better after prednisone. She takes a wheelchair to school and for distance, is able to walk short distances with cane, and without cane she concentrates walking slowly to avoid limp. She is very bright, highly motivated and described the limb as cold, aching, throbbing, shooting, stabbing, sharp, tender, burning, exhausting, tiring, miserable, unbearable. Pain severely interfered with walking, work, sleep, enjoyment of life, general activity, and relations with others. At rare times, the limb would jump. Numbness was present posteriorly off and on, especially when sitting, not present when standing. She had good health until mononucleosis at age 13 in October 2007. A few weeks later irritable bowel syndrome began (IBS-C), then CRPS began after injury March 2009, reinjury July 2009, then no problems until February 2011. The initial injury occurred when roughhousing with a friend, and her foot pulled her toes in a dorsiflexed position. The next day it was swollen and purple with bruising pain after the first injury. She was in a boot for several weeks. CRPS improved, she went to Peru climbing Machu Pichu when she was reinjured again. The foot was swollen, burning with allodynia. She was taken to a hospital in Chile where they wrapped the foot, advised to take Advil. Once home, she went to physical therapy. It resolved in 6 weeks. February 2011, fulfilling PE for high school, she tried out for swim team. Day two, she had pain from kicking in the water and was never able to get back into the water. She was in crutches the next 2.5 months and began physical therapy three times weekly since then. Pain began in the sole of the foot, but a slip and fall in the rain caused pain to spread to the hip. A flare in the past month caused pain much more in the left knee after prolonged sitting for tests. She now takes her wheelchair to school which she began to use early October 2011. She was in the chair consistently two weeks, now only as needed, and never uses it at home. She has used a cane since later April when she got off her crutches. In hot weather, the cold left lower limb sweats profusely. No hair changes. On prednisone, toes nails grow faster. She has used warm and cold compresses to relieve pain. She failed gabapentin when it caused her to be nonfunctional on 900 mg/day with no relief. Lyrica caused hives. Nortriptyline caused personality change, becoming very mean, an Atilla the Hun, opposite her usual good nature. Cymbalta 20 mg – severe dry throat, thick mucous, medications lodged in esophagus. Tried Tramadol 25 mg TID and Naproxen 500 bid. Incidentally, she saw a neurologist at Children’s Hospital in 2009 due to sudden onset of diplopia that was found due to allergy to contacts, and resolved with new contacts. She saw an allergist in 2010, and tested positive for nonspecific autoimmune disorder: ANA 1:160 speckled, positive for food sensitivities, and after four months of stopping certain foods, ANA was negative: gluten, dairy, garlic, broccoli, lima beans, banana, asparagus, pineapple, oyster, mushroom. While eating those foods she had IBS-C, stomach would harden, causing vomiting, and she lost 30 lbs, was 120 before —- it is part of the leaky gut syndrome that prevented her to absorb certain nutrients. She has regained weight and all symptoms resolved. She does not have dry mouth or dry eyes. She is sensitive to normal doses of medications like her grandmother. Exam: Toes are cold on the left. At the moment, no changes in hair, skin color, temperature, sweating. Stretch reflexes symmetrical, brisk in both lower limbs. She uses a cane but is able to walk slowly without limp, carefully, holding both arms stiffly at her side as she concentrates on walking. Sensory examination was not detailed due to patient discomfort and long trip from home that was very tiring. Treatment: Prednisone was rapidly tapered off. Begin 1 mg low dose naltrexone [LDN]. Begin N-acetyl cysteine [NAC] 600 mg x 3/day for “cold” CRPS – it is reported to take 3 or 4 months to help. Encouraged mom to continue increasing LDN as tolerated. Needless to say, it makes me very happy to know I am able to help someone in pain, especially a child. Background. 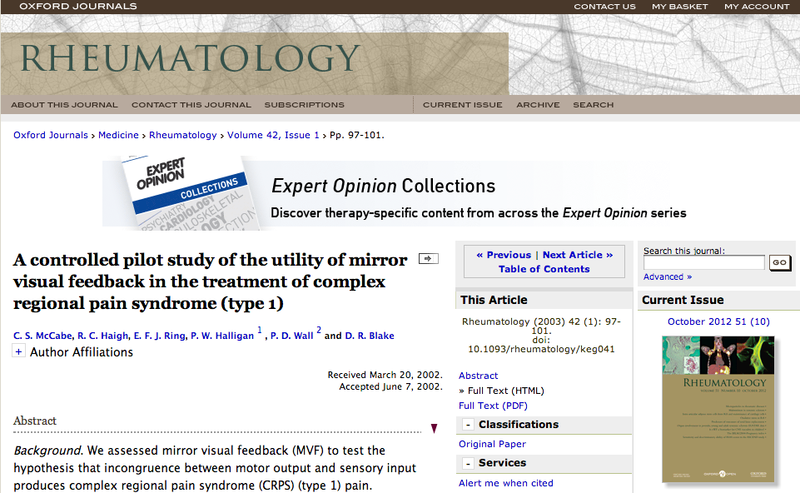 We assessed mirror visual feedback (MVF) to test the hypothesis that incongruence between motor output and sensory input produces complex regional pain syndrome (CRPS) (type 1) pain. Methods. Eight subjects (disease duration ≥3 weeks to ≤3 yr) were studied over 6 weeks with assessments including two controls (no device and viewing a non‐reflective surface) and the intervention (MVF). Pain severity and vasomotor changes were recorded. Results. The control stages had no analgesic effect. MVF in early CRPS (≤8 weeks) had an immediate analgesic effect and in intermediate disease (≤1 yr) led to a reduction in stiffness. At 6 weeks, normalization of function and thermal differences had occurred (early and intermediate disease). No change was found in chronic CRPS. Conclusions. In early CRPS (type 1), visual input from a moving, unaffected limb re‐establishes the pain‐free relationship between sensory feedback and motor execution. Trophic changes and a less plastic neural pathway preclude this in chronic disease. Introduction. Complex Regional Pain Syndrome Type I (CRPS-I) is a devastating pain condition that is refractory to standard care. Preliminary evidence suggests the possibility that neurofeedback training might benefit patients with chronic pain, including patients with CRPS-I. 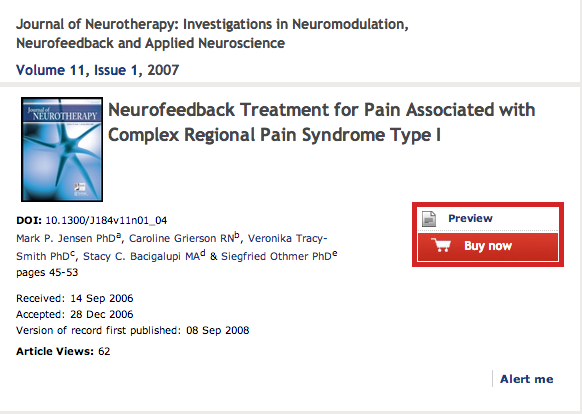 The current study sought to address the need for more information about the effects of neurofeedback on pain in persons with chronic pain by (1) determining the average decrease in pain in patients with CRPS-I following neurofeedback training, (2) identifying the percent of patients reporting pain decreases that are clinically meaningful, and (3) documenting other benefits of neurofeedback training. Method. Eighteen individuals with CRPS-I participating in a multidisciplinary treatment program were administered 0–10 numerical rating scale measures of pain intensity at their primary pain site, as well as pain at other sites and other symptoms, before and after a 30 minute neurofeedback training session. A series of t-tests were performed to determine the significance of any changes in symptoms observed. We also computed the effect sizes and percent change associated with the observed changes in order to help interpret the magnitude of observed improvements in symptoms. Results. There was a substantial and statistically significant pre- to post-session decrease in pain intensity at the primary pain site on average, with half of the study participants reporting changes in pain intensity that were clinically meaningful. Five of seven secondary outcome measures also showed statistically significant improvements following neurofeedback treatment. Conclusions. The findings suggest that many patients who receive neurofeedback training report significant and substantial short-term reductions in their experience of pain, as well as improvements in a number of other pain- and nonpain-specific symptoms. The findings support the need for additional research to further examine the long-term effects and mechanisms of neurofeedback training for patients with chronic pain.